Wow! I feel I have to share this recipe with you…. Spotted it on a website http://www.bonappetit.com a while back, saved it and have been dying to make it ever since! Well, tonight was the night!!! Served with roast lamb, but would be excellent as a starter or served with white fish. I’m planning to use it again with fried Forestiere Mushrooms and a little hard goats cheese grated on the top for good measure! Preparation: Core tomatoes and cut into quarters. Peel and chop garlic cloves. Finely chop olives. Thinly slice sun-dried tomatoes, Chop parsley. Remove leaves and trim stem end of cauliflower, leaving core intact. Place cauliflower core side down on a work surface. Using a large knife, slice cauliflower into four 1/2″ ‘steaks’ from centre of cauliflower (some florets will break loose; reserve). Finely chop enough loose florets to measure 1/2 cup. 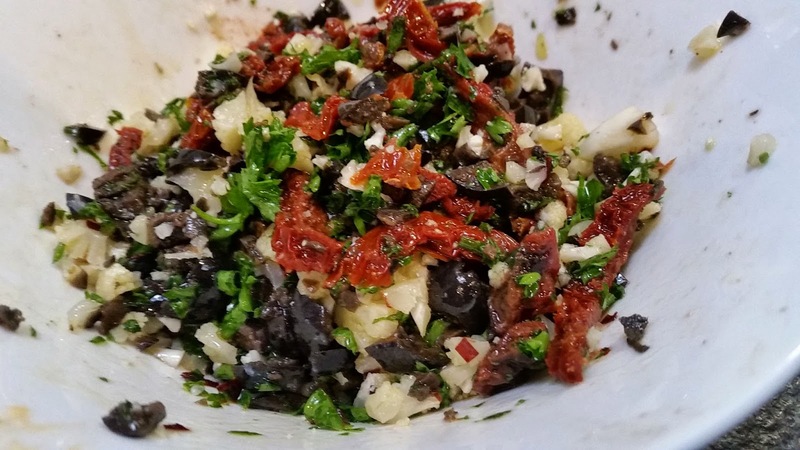 Transfer chopped florets to a small bowl and mix with olives, sun-dried tomatoes, 1 tbsp. oil, parsley, and lemon juice. Season relish with salt and pepper. This mixture will be the crunchy garnish to the final dish. I added a small dried chilli at this point (not listed in ingredients). Preheat oven to 200°C. Heat ovenproof skillet over medium-high heat. When hot, spray with 10 sprays of the olive oil spray. 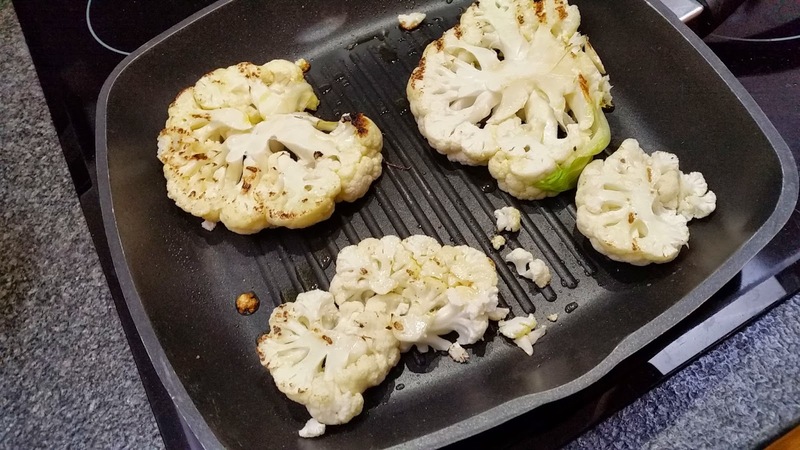 Working in 2 batches, cook cauliflower steaks until golden brown, about 2 minutes per side, spraying pan with oil between batches. Transfer steaks to a large rimmed baking sheet. 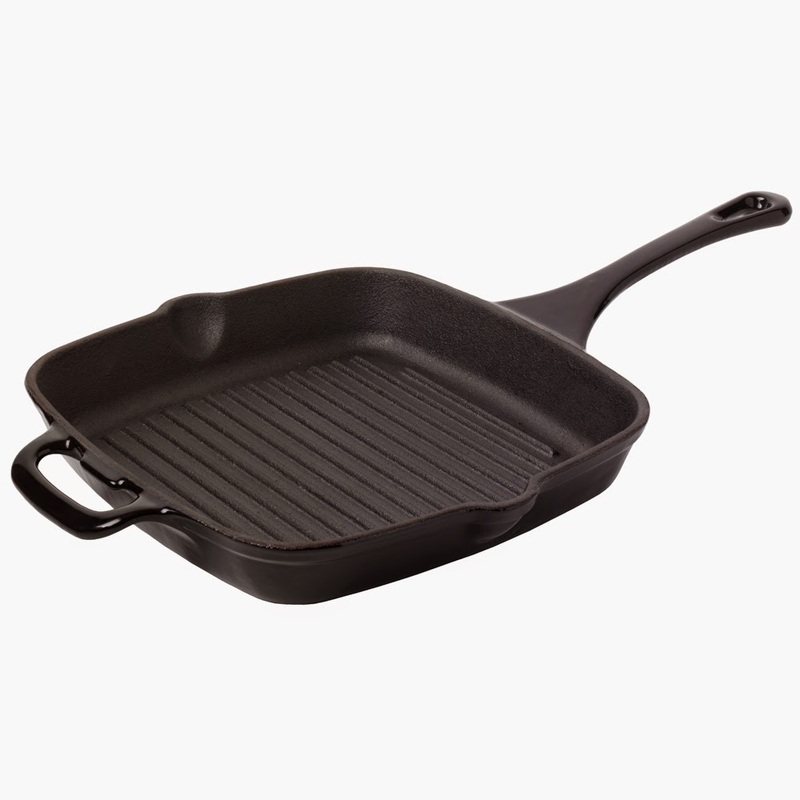 Reserve skillet. 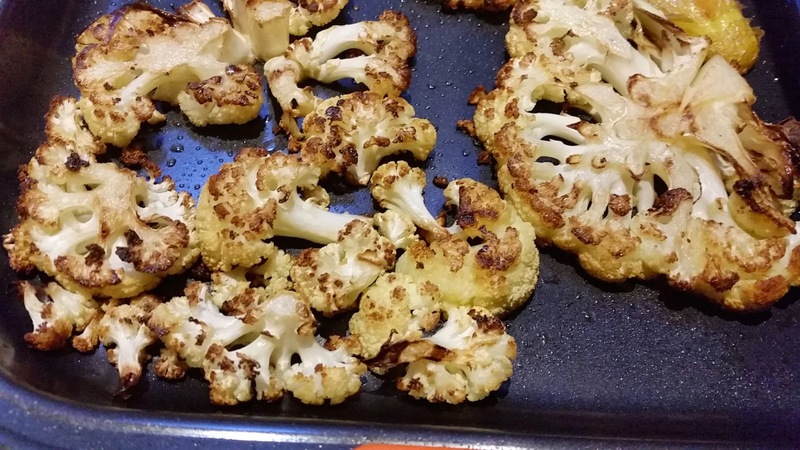 Roast cauliflower until tender, about 15 minutes. Meanwhile, return skillet to medium-high heat and add garlic cloves and tomatoes, one cut side down. Cook until tomatoes are browned; turn tomatoes over and transfer skillet to oven with cauliflower. Continue roasting everything until tender, about 12 minutes. Transfer garlic and tomato mixture to a blender; puree until smooth. Season with salt and pepper. Divide tomato sauce among plates. 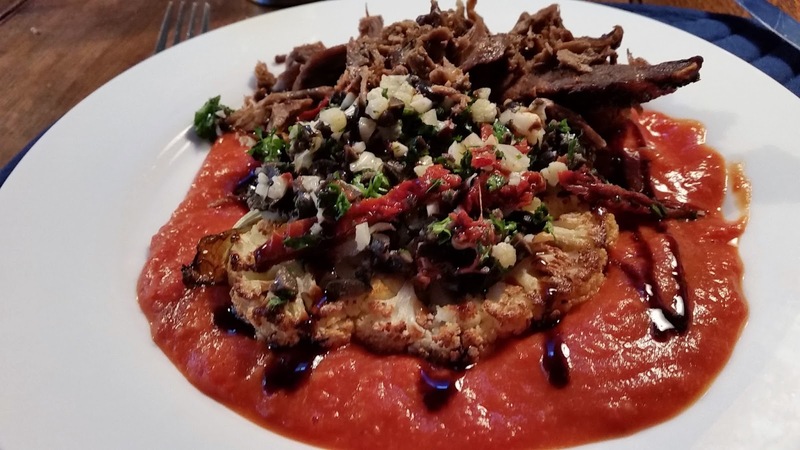 Place a cauliflower steak on each plate; spoon tomato/garlic relish over and sprinkle with the crunchy chopped vegetable and olive topping. As shown in the picture, I topped mine with a balsamic glaze – just a tiny drizzle really emphasised the flavours. Peel larger carrots and cut into quarters lengthwise. Wash baby carrots and remove stalks. Peel and crush garlic. Spray 15 spays of one cal olive oil spray onto a roasting dish. Add carrots, cumin and garlic and toss, spray with another 15 sprays of one cal spray. Roast for about 30 minutes, stirring half way through cooking time. 5 minutes before the end of cooking time, sprinkle with the sesame seeds. Arrange salad leaves in a bowl. 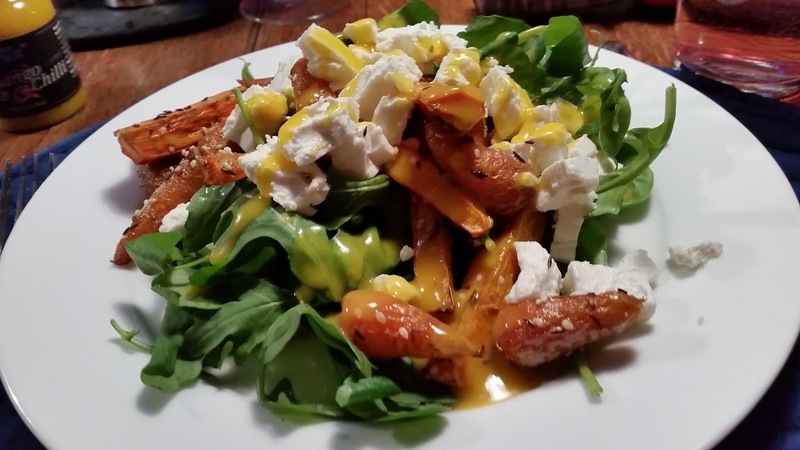 Top with the roasted carrots and crumbled feta cheese. Scatter the coriander over and serve. Add salad dressing of choice. I didn’t have any coriander, but I think it would make a wonderful addition! This week, I weighed in at my LOWEST weight yet. 9st 4.4lb! Amazing given the scoffing I did at the girlies weekend I enjoyed last weekend! Two fasts sorted out the over-indulgence! 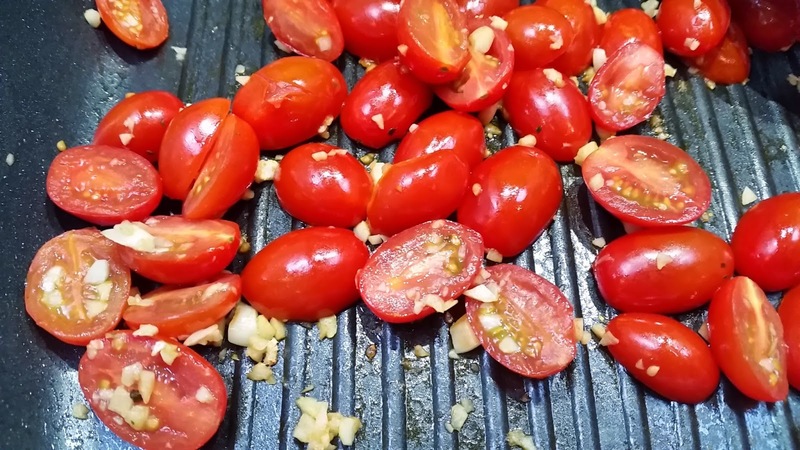 Griddle pan – give vegetables a whole new dimension…. Vegetables have become very much a staple part of my intake each day. Luckily I love them! I have started to experiment with different ways of cooking them to change the flavour and texture, and roasting and griddling most definitely are the way to go! I use a griddle pan like this: just a tiny amount of oil and on a low heat for about 30 minutes turns courgette, mushrooms, asparagus and many other vegetables into a caramelised mouthful of heaven! I have developed a huge love of roasted butternut squash. No need to peel (the skin softens), but cut up into 2cm chunks, take seeds out, spray baking tray with one calorie olive oil spray, add butternut squash BNS, spray again and bake for 30 mins at 200 , turning half way through. 250g of it cooked in this way is only 88 calories! I serve it alongside my meal instead of potatoes/rice/pasta. In fact, all kinds of veg are delicious roasted… roasting really intensifies the flavours – carrots and parsnips become super sweet and courgette cut into thinnish strips and roasted in the oven caramelises takes on a whole different flavour of its own. 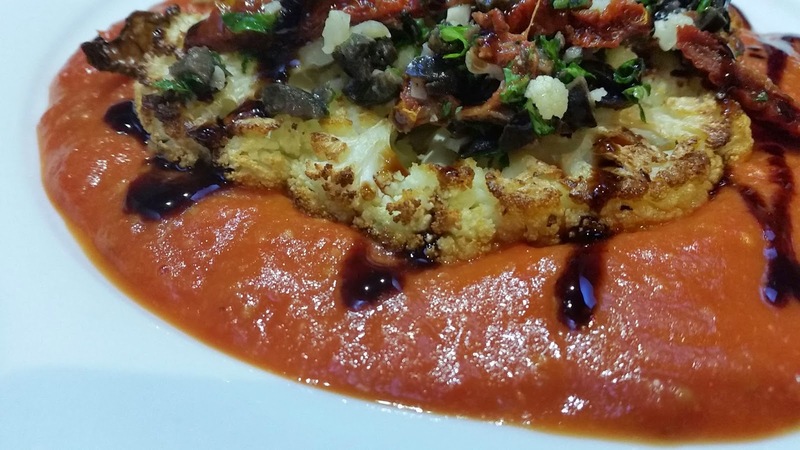 Cauliflower – how’s about pureed cauliflower (in place of potato) or….. (and I keep meaning to try this recipe) – cauliflower steaks? Sweet potato – bake it in the oven, leave the skin – it looks a bit yukky but tastes divine….. Serve with a salad! Well, salad makes a nice change to regular “veg”. Plenty of low calorie vegetables is certainly the way to go for me since I’ve been on 1,100 calories a day – even with the fasting and exercise! Convenience foods also play their part in my diet. Earlier in the week I enjoyed “Creamy Chicken & mushrooms” made from scratch with Philadelphia Stir and Serve Garlic and Herb sauce, served with a big pile of swede (150g) and savoy cabbage(130g)! Whole meal (big plateful, and one whole chicken breast) was just 311 calories!! !